Machine quilting patterns are available to match various skill levels and interests. Machine quilting is the term for the creation of a quilt with a sewing machine. The two main machine quilting techniques are machine guided sewing and free motion sewing. The machine guided technique creates straight and slightly curved stitched lines. The free motion method makes intricate patterns and designs. Machine quilting is an affordable craft to take up. Any sewing machine can be adapted for use in machine quilting with special feet attachments. The only other quilting specific supplies you need are quilting needles. Quilting with sewing machines requires extra sharp needles that can penetrate multiple layers of fabric. You can use any high quality thread needed for the quilting project. However, do not use hand quilting thread because it has a wax coating on it that can damage the sewing machine. Bobbin thread should always be made of 100 percent cotton in quilting for best results. Sewing machines allow you to sew a quilt faster than hand quilting. You can create complicated designs and rely on a consistent stitch quality throughout the design. Machine quilting also allows people of all sewing skill levels to enjoy making complex quilts. This is the only way that a beginner could complete a detailed quilt without assistance from someone with more experience. Using a pattern for machine quilting makes the quilting process more efficient. A pattern provides a template for a quilt design which can be cut out, attached to fabric and used as a guide during sewing. It also provides detailed instructions that can assist both beginner and experienced sewers with complicated designs. Machine quilting patterns come in a variety of designs from artistic to holiday themes. You can find a pattern for every occasion or to match any room décor. Before you search for a pattern, think about what type of project you want to work on. Write down your ideas or sketch any design concepts to help you select the right pattern. You can find a large selection of machine quilting patterns in local sewing, craft and fabric stores. Look for free patterns online and in sewing magazines. Embroidery Etcetera--The site sells quilt patterns in designs such as snowmen, birdhouses, stars and flowers. Happiness is Quilting--The retail site sells patterns for traditional quilt designs. The American Quilter's Society--The organization sells books with a variety of machine patterns. Make Baby Stuff--The site has a free baby quilt machine pattern with detailed instructions. Andover Fabrics--Andover Fabrics provides a number of free quilt patterns. Ann Fahl--This is the site of a prize-winning quilter who sells her quilt pattern designs. Her designs are modern and artistic. Amazon--Amazon sells many quilt patterns such as a patchwork quilts and Amish quilts. eBay--The auction site periodically sells quilt patterns. You can also design your own quilt pattern. Think of a design and sketch it out on a drawing pad. Compare it to another quilt pattern to adjust the size of design details. Experiment with design ideas until you find one that you want to pursue. 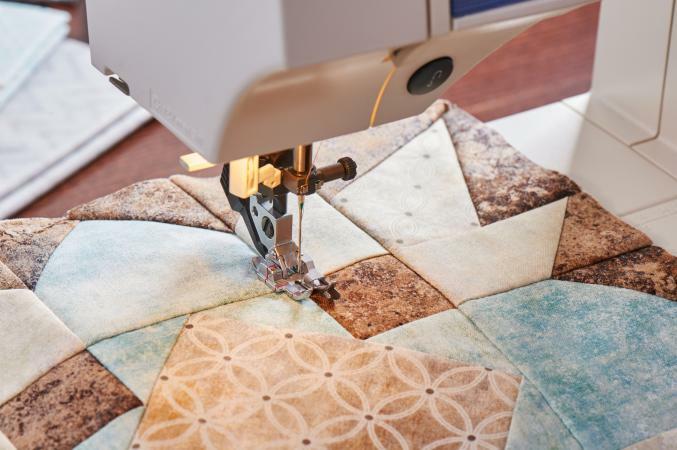 Quilters of all skill levels can benefit from a machine pattern. Those interested in creating complex designs will find patterns indispensable. Anyone can find a pattern to meet her taste. The beautiful sight of a finished quilt may even inspire some impatient hand quilters to give the sewing machine a try.